Mr. Mehta is an established businessperson based out of Ahmedabad. He visits US and Canada on frequent basis for his business purpose. Mr. Mehta only chooses single-trip travel insurance. Most of his trips consist of 6-8 days and he opts for sum insured $ 5 Lakh. Usually, he makes 6-8 trips per year. Mr. Mehta Could Have Saved by Opting for Annual Multi-Trip Travel Policy For each of his trip, Mr. Mehta spends a minimum of Rs. 933. So, for 6 trips in a given year, he pays Rs. 5,598(Rs. 933 x 6) for premium by choosing single trip travel plans. Here is a premium table that shows 4 lowest premiums for 8 days trip to USA and Canada. Had Mr. Mehta chosen an annual multi-trip travel plan he could have easily saved significant amount of money. For a sum insured of $5 Lakh, Mr Mehta had to pay just Rs. 4,115 in a given year. This simply proves how cost-effective multi-trip plans are. Mr. Mehta could have saved Rs. 1483(Rs. 5,598 – Rs. 4,115) every year simply by availing an annual multi-trip travel cover. Mr. Mehta could save over Rs. 10,000 in 7 years which means annual multi-trip travel policies are well and truly cost-effective travel plans in the long run. What Extent of Cover Would Mr. Mehta Receive in Case He Chose for Annual Multi-Trip Policy? The extent of coverage depends largely on insurers and the sum insured amount chosen. However, all annual multi-trip policy, just like regular single trip plans provides policyholders with some basic coverage. This regular coverage encompasses medical treatments, flight or trip cancellation or delay, loss of baggage and passport cover. Aside from these mandatory protections, multi trip annual travel policies can also offer some additional protections such as coverage for failure of scheduled airline, loss of holiday money and other valuables and coverage for personal liability or personal accident and legal expenses. Mr. Mehta, prior to getting coverage for his annual travel insurance plan needed to ensure that his chosen sum insured amount is sufficient to protect him against various untoward events such as illness, loss of items, cancellation and liabilities. Here is a break-up of the coverage amount that Mr. Mehta is entitled to receive for his annual travel plan. Coverage for Medical Expenses, Evacuation and Repatriation This depends a lot on the destination chosen. If it is either USA or Canada where medical costs are very high, you should select a plan that offers maximum coverage against your chosen sum insured amount. All the 4 annual multi-trip travel plans mentioned above provide Mr. Mehta with medical coverage equal to sum insured chosen i.e. ; $ 5 Lakh. Coverage for Personal Liability Personal liabilities expenses can make a dent in one’s fund, especially during a vacation. Hence, one should look for a travel cover that provides maximum compensation for the same sum insured amount. All 4 annual multi-trip plans available for Mr. Mehta including the ICICI Lombard plan offer financial coverage for personal liabilities. However, the best coverage is provided by Reliance and the amount is $2.5 Lakh. Coverage for Cancellation of Trip One needs to find a travel plan that offers equal amount of one’s holiday expenditure as compensation for trip cancellation. Mr. Mehta would have to choose between two annual multi-trip travel covers offered by ICICI Lombard and Reliance as only these two insurers offer financial coverage for trip cancellation for his chosen sum insured amount of $ 5 Lakh. Out of these two plans, again the travel plan by Reliance is more beneficial than that of ICICI Lombard as its amount of compensation is better. 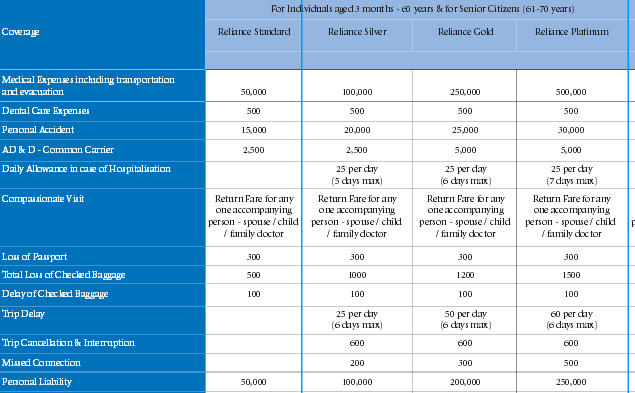 Reliance offers $600 compared to $500 offered by ICICI Lombard. Coverage for Loss of Baggage Again, Reliance would be Mr. Mehta’s best pick as this insurer offers best coverage i.e. $1500 for loss of checked baggage. There are 3 other insurers including ICICI Lombard that offer compensation for baggage loss and the amount ranges between $500 and $1000. Who Aside from Business People Are Suitable for Annual Multi-Trip Travel Insurance? Not only business trips, annual multi-trip travel plans are cost-effective options for individuals as well. With each passing year, traveling is becoming increasingly affordable and earning of individuals is also on the rise. Instead of going for one trip per year which is like a norm among most Indian vacationers, many individuals and couples are having multiple trips in a particular year. For these people who want to stay covered for more than three vacations in a given year, an annual multi-trip travel cover can well be the cheapest option. How Many Days Could Mr. Mehta Travel for? Annual multi-trip travel insurance policies usually safeguard those travelers that go for a trip three times or more in a particular year. Generally most insurers come with an upper limit when it comes to number of days per trip. Typically the limit is 30 days; however one may also come across travel policy providers that extend this limit to 45, 60 and even 90 days. It doesn’t matter how many trips an insured person makes in a year as long as his trips are within the duration fixed by the insurer. On advanced insurance comparison portals like GIBL one can even choose 90 days as the maximum trip days. But, there will be very few insurers available in that case. Hence, Mr. Mehta could have made unlimited trips keeping the tenure of each trip within the limit. What Types of Trips Are Not Ideal to be Covered by Annual Multi-Trip Travel Cover? Those who plan to stay at a particular place for longer period of time are better off looking for single trip travel plans. 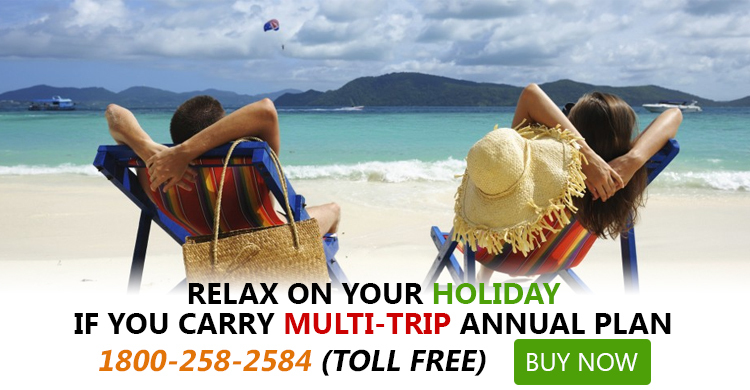 Multi-trip travel covers come with restrictions on number of days per trip. Those who are undergoing medical check-ups should also not avail this type of travel cover as they have to make their insurers aware of their medical conditions each time they plan to travel. For these people, a single trip travel plan with good coverage for pre-existing medical condition is the perfect option. Those who are travelling to participate in activities that insurers consider dangerous, may not be able to enjoy all the coverage available in an annual trip. Some insurers impose an upper age restriction while issuing such travel covers. One should, therefore, go through the policy wording prior to settling with any particular travel insurance plan. To conclude, annual multi-trip travel covers are like gold for corporate person like Mr. Mehta. Individuals and couples looking for multiple trips in a year are also good candidate for this travel plan. Hopefully, this blog has touched upon all the crucial aspects of annual multi-trip plans and good enough to help out prospective policy buyers make an informed decision. You can visit the travel insurance page of GIBL and do the comparison to unearth best policy quotes. And, feel free to make comments and queries if there is anything more you need to know.